Bugs was a little worse for wear when he arrived at our North Melbourne shelter in January. The two-year-old moggie had a severe infection in his left ear and, unusually, his head was tilted to that side. “This infection would have been very uncomfortable for Bugs. Our first priority was to ease his discomfort, so we cleaned out his ear and started treatment with antibiotics right away,” said Amanda, cattery coordinator at the Home. Unfortunately this was not the end of Bugs’ worries. Upon closer examination, our vets discovered that he had an abnormal growth in his ear, which had to be surgically removed. “Despite his ordeal, Bugs was a very friendly and smoochy patient,” said Amanda. Bugs has made a smooth recovery from his infection and is now ready to find a special new home. Bugs is a very nice cat. He has lots of love and affection to offer,” said Amanda. “Bugs’ head is still tilted to his left side. This is not causing him any pain or discomfort, however, it may be permanent. His new family will need to keep an eye on his ears, as there is a possibility that infections will occur in the future. 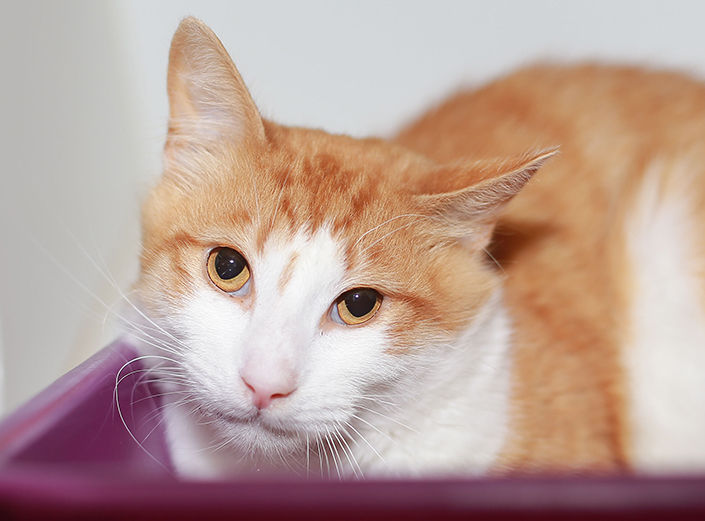 If you can offer a special home to a special cat, view Bugs’ (ID 1024990) adoption profile or meet him at our North Melbourne shelter. Until 12 February 2017, there’s no fee to adopt an adult cat like Bugs.